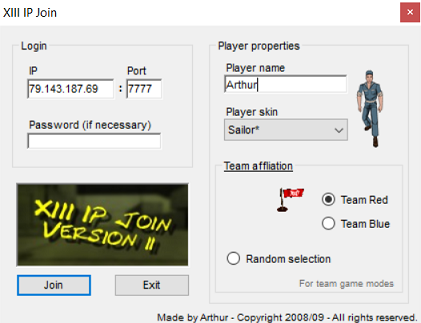 Download XIII IP Join and copypaste the IP from this site. You can customize your appearance in the game. Press F2, type in SWITCHLEVEL and the noted IP address and press return. You should be connecting to the server. Required ports to forward: 7099 (ping lamp) and 7777 (connect to server), both UDP. Download the Standalone Dedicated XIII Server and the Update Files 2018. Unpack it wherever you like and open its System folder. server < UCC can execute various "commandlets". The "server" commandlet is the one for launching a server. If you've installed the standalone server correctly, the settings should already be set as needed. Note for hosting on Linux: To execute UCC.exe, install wine and execute the commandline like that: "wine UCC.exe server DM_Banque.unr?..." To show the correct gametype in the server overview.